True fasting means abstinence not only from food, but "to control the tongue, to alienate the passions, to forbear from anger, to abstain from lust, slander, falsehood and perjury." The abstinence of food and so-called adult carnal misconduct is perhaps the easiest struggle. But effort against harder things is needed, such as condemnation, envy, slander, etc. The Prophet David pleaded with God to keep him from slander, in order to fulfill His commandments: "Redeem me from the slander of men and I will keep Your commandments." Fasting that is "true and pleasing" to God is as we mentioned above, and "to alienate the passions" means to transform the passions, to be healed of the passions. Human passions are nothing else but the unnatural operation of the powers of the soul, namely the intelligent, the incensive and the desiring. The virtues are the natural movements of the powers of the soul. For example, when anger operates according to nature then it turns against the devil and sin, but when it is against nature it turns against other people, even against this creation, such as animals, plants, etc. The intelligent part of the soul in its natural state turns to God, and the desiring wants everything that is pleasing to God. Otherwise it is directed against the will of God and is enslaved to the devil and created things. The therapy of the powers of the soul, or their restoration to their natural operation takes place with abstinence, prayer and love. Maximus the Confessor says to us: "The incensive part of the soul is restrained by love, the desiring is withered by temperance and the intelligent is given wings by prayer. Thus the light of the nous is never darkened." Saints are those who have purified their vessels, who have transformed their passions and attained from the image to the likeness of God and have seen God. They are full of the Holy Spirit and their words are "words of eternal life". They are the champions of spiritual athletics and true models of the athletes of the spirit. One of these was Saint Sophronios, whose memory is celebrated during this period. He lived in temperance and wisdom from a young age, and later also when he became a Monk in the Monastery of Saint Theodosius the Cenobiarch. 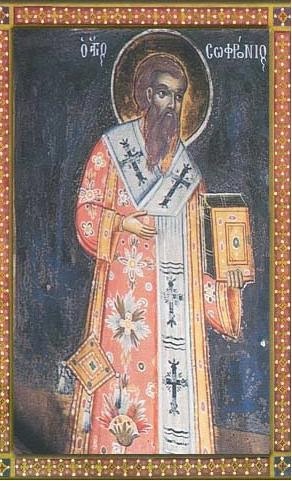 He became Archbishop of Jerusalem "due to his abundant virtues", as Saint Nikodemos the Hagiorite says, and he shepherded his flock in an Orthodox ascetic and sacrificial ethos that distinguished him. He was a man of the spirit in the true sense. That is, he was full of the Grace of the Holy Spirit. He acquired spiritual eyes, or rather he purified his nous, which is the eye of the soul, and he saw God, which is why he was able to lead his flock unerringly. According to the expression of the author of the Great Canon, he was a "nous that beheld God". When Jerusalem was captured by the Persians, he was given hospitality in Alexandria by his friend Saint John the Merciful, and when he "departed to the Lord" he wrote a funeral discourse in his honor and "was very saddened by his passing". The saints have a pure and soft hearts. They truly love and weep for their loved ones, like Christ wept for his friend Lazarus. But they do not grieve "as those who have no hope", but as having hope in eternal life, since they are crucified and resurrected and taste the kingdom of heaven in this present life. Here we should mention that he wrote among other things also the wondrous life of she who was equal to the angels, the venerable Mary of Egypt. Through the intercessions of the wise Saint Sophronios, may God grant us a "spirit of wisdom, humility, patience and love", as well as a zest and appetite for spiritual struggles. Source: Ekklesiastiki Paremvasi, "ΑΓΙΟΣ ΣΩΦΡΟΝΙΟΣ", March 1998. Translated by John Sanidopoulos.